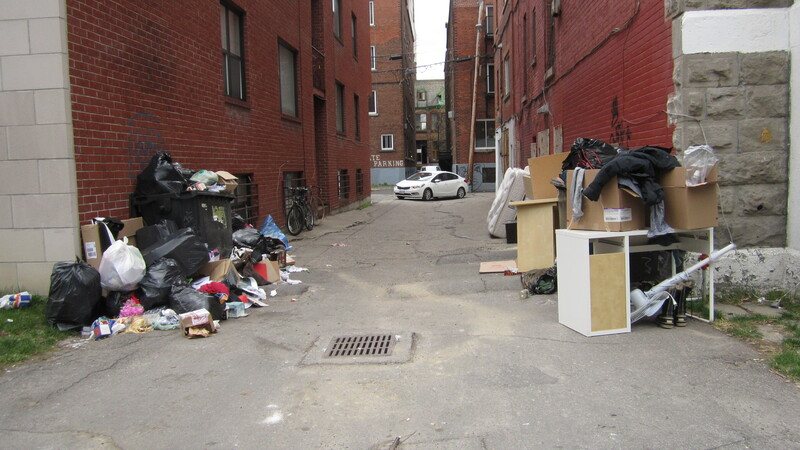 I spent a lot of time at the end of April cruising the streets of a nearby university neighbourhood, hoping to find great move-out related trash. Move-out day is a phenomenon in every university town, but especially those with high international student populations. Basically, when kids finish the spring semester many of them move (often home / far away) around the same time. As you can imagine this results in a lot of great trash. The kids aren’t often all that organized, and a lot of them are quite privileged as well – us trash pickers are thus doubly blessed, triply when you consider just how many people are moving at once. 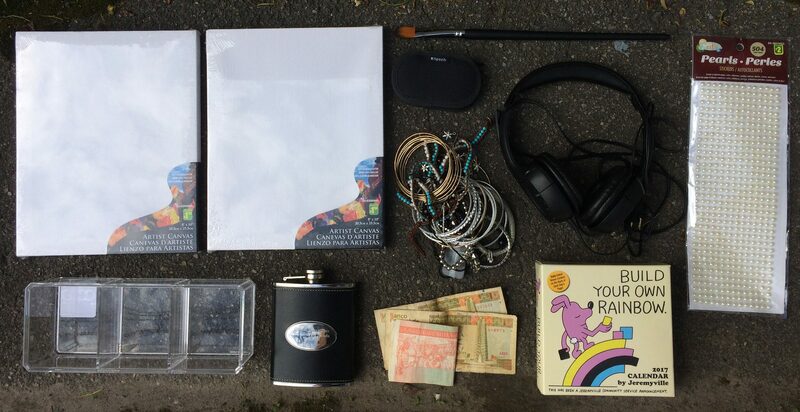 Last year I did very well, finding a working MacBook Pro, and iPad, a couple of valuable perfumes, change (including loonies and toonies), and even some bills. However, I realize now that I got pretty lucky. I used to think that May 1st was the biggest day for garbage, but this year I figured out that April 30th is best. Last year I was actually late to the party, and was lucky to come away with some great finds regardless. I’m surprised I made that mistake, as now it seems obvious that most of the moving would happen before the end of the month. The mistake didn’t effect this years results anyways. My plan was always to go to the area early and often in hopes that I’d get the first pick of as much garbage as possible. I knew that even if the 1st was the best day, it wasn’t the only day – some people were bound to move out before that. 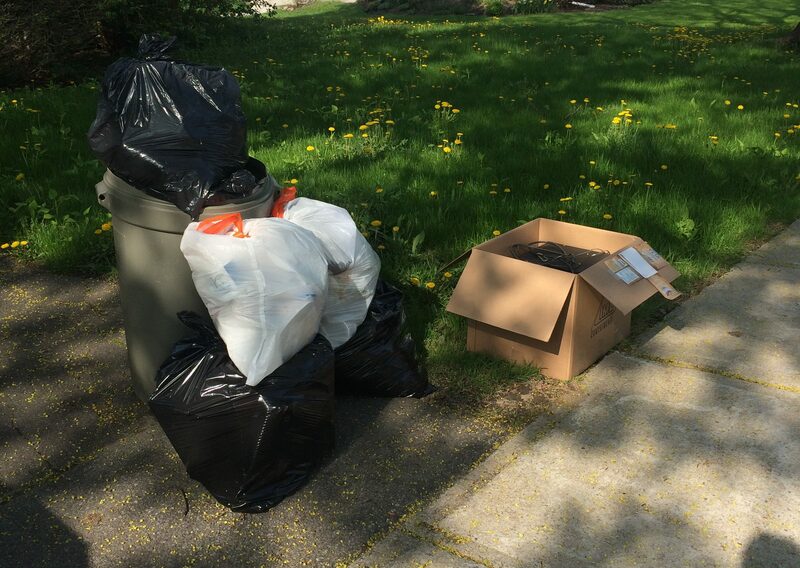 There’s actually a lot of competition for move-out day garbage, so it pays off to put in that extra effort. I ended up having a pretty productive few days! My finds don’t quite match up with last years, but they’re still very good. I think I was most excited about finding another MacBook Pro. The things are like money in the bank – even when broken they typically sell for three figures. I know I’m going to have at least a decent day when I see that silvery plastic shell. Thankfully, I found one in the trash pile above. I could see it through a little hole in the bag. The MBP, a 13″ Mid 2010 with a good screen (but no HD and perhaps other issues) sold quickly for 180$. 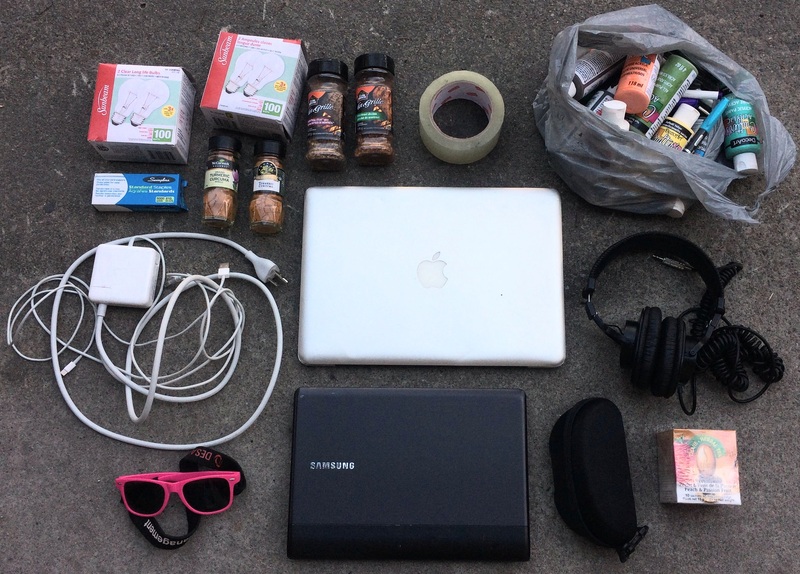 But I found lots of other good stuff that day, including a Samsung notebook that seems to work fine (it runs Ubuntu though so it’s a little harder to do a factory reset), a nice pair of Sony headphones that are worth around 60$, and some tea, spices, and paints. I had good luck with laptops. 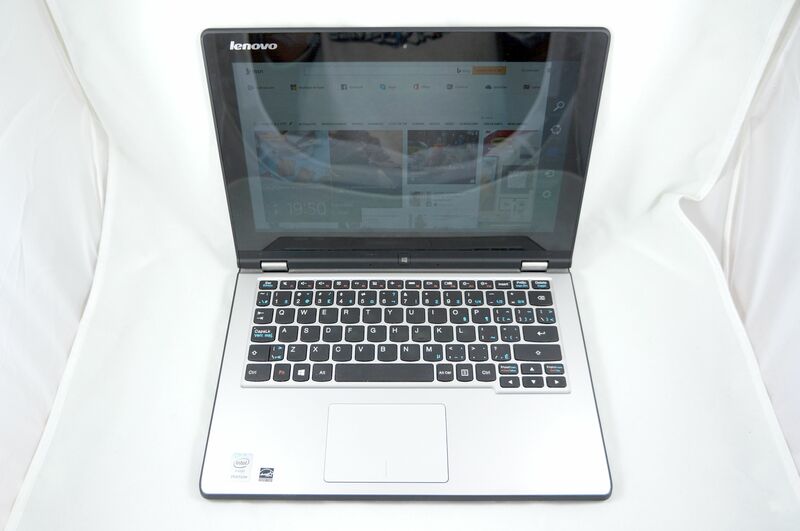 I found another one, a Lenovo Yoga 2 not far from my storage. This one is actually in very nice condition except for an issue with the screen, which flickers and stays off about 95% of the time. I was persistent and managed to get it working (mostly through determination / sitting in front of it for a while) long enough to do a factory reset and test the internet. It’s a nice little laptop that should sell for around 175$ even with the screen problems. People were throwing away Plantronics earphones left right and center. I found three different pairs, all of which worked fine. I guess they were cheap enough (24.95, according to the packaging) to not worry about. I also found two pairs of Qatar Airways headphones with noise cancellation. 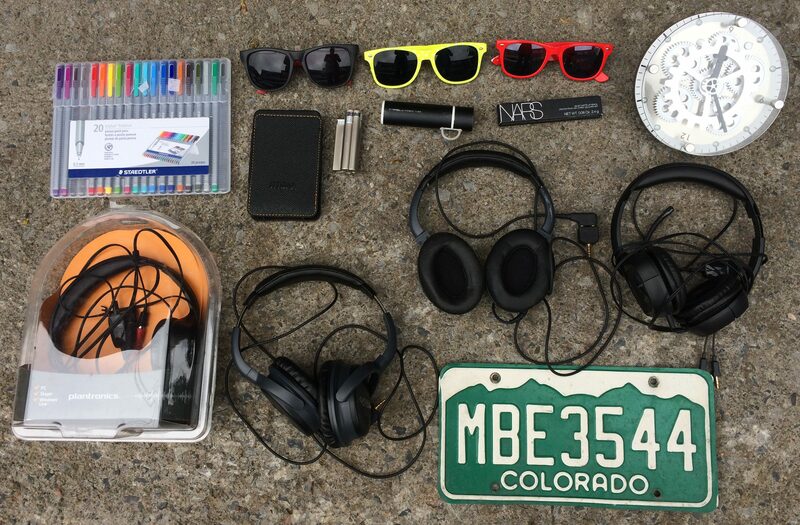 I sold the lot (minus the fancier Sony headphones) to one person at my yard sale for 15$, which I think was fair for both sides. There’s always some dumb frosh / frat stuff that gets thrown out en masse on moving day. This year it was sunglasses. The design is actually pretty cool, but they’re almost always emblazoned with some slogan that makes them a hard sell. I also found a 1tb external hard drive. I haven’t been able to get it working yet, but it might just be my computer being weird. Here’s some semi-useful stuff. There’s so much to choose from that you really have to limit what you take. 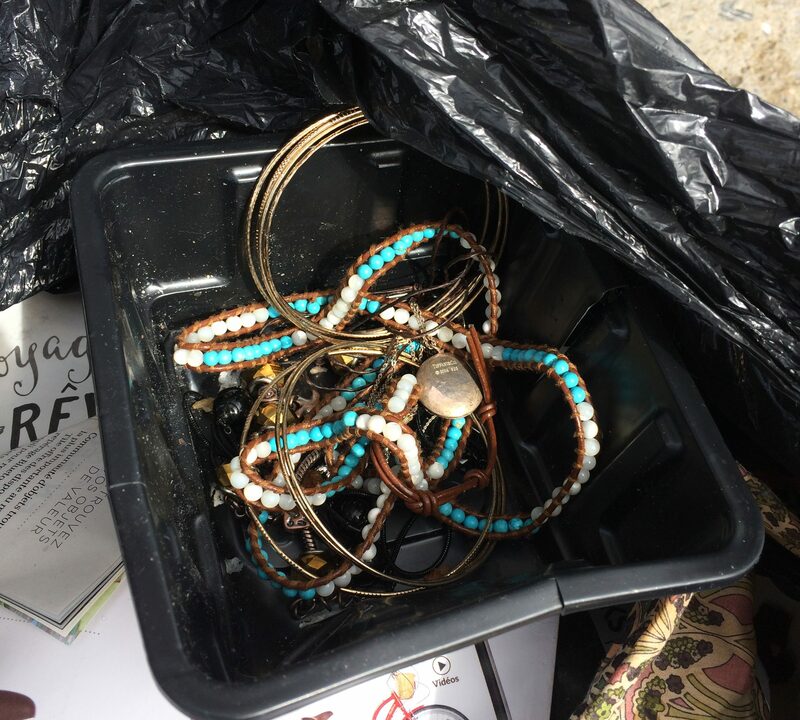 The jewelry was almost exclusively junk that ended up in a free box. I sold the two canvases for a dollar, and the Cuban pesos for another dollar. 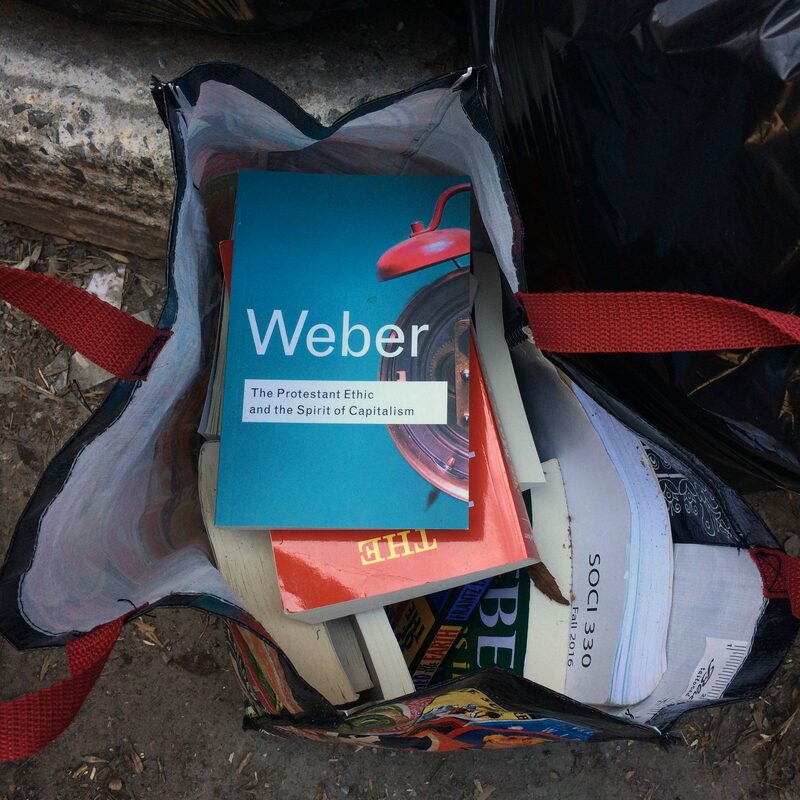 I found a shopping bag full of books that reminded me of my Sociology degree (I actually still have a copy of The Protestant Work Ethic & The Spirit of Capitalism). I sold most of them to some guy at my yard sale for 10$. 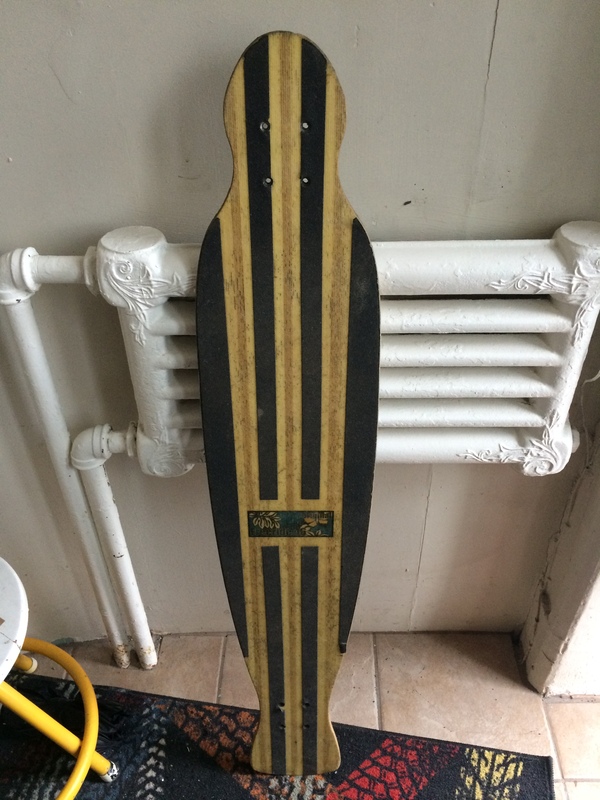 I also found a longboard that my skateboarding expert friend says should sell for around 60$. I opened up a bag on St Urbain and was greeted with a mushroom container full of jewelry. Most of it was junk, but I did find a locket that was marked as being made by Tiffany in 2004. The locket looks legit in a lot of ways, but Tiffany is commonly faked and it’s best I determine the authenticity one way or the other before selling it. I can’t find a similar piece online, which might be a good thing as most fakes are based on well-known and popular designs. I took a few extra pictures which you can see below, and if you have any potential insights let me know in the comments! 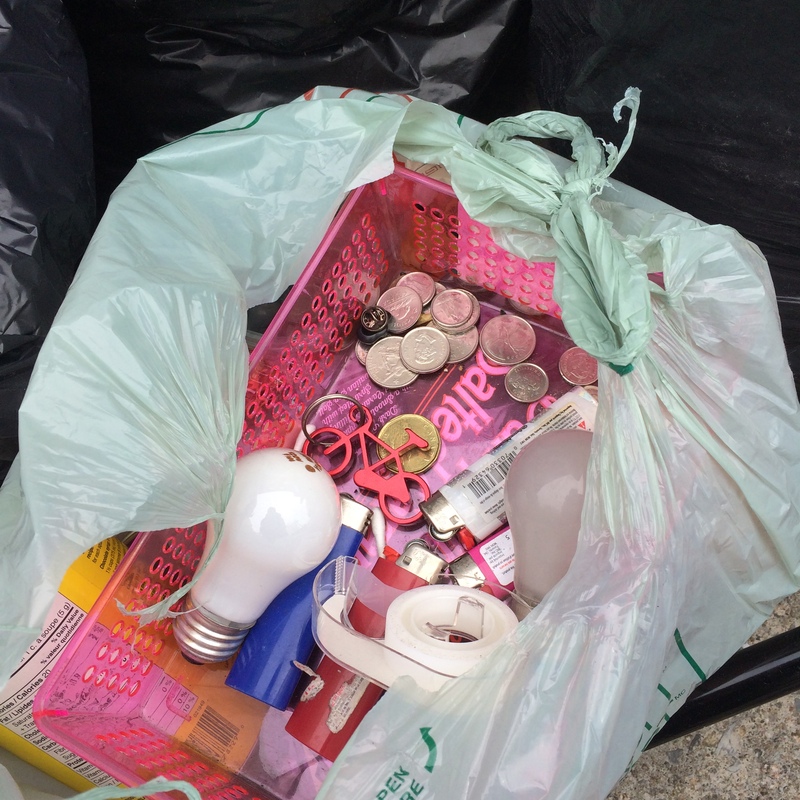 Otherwise, the kids always throw out lots of change. 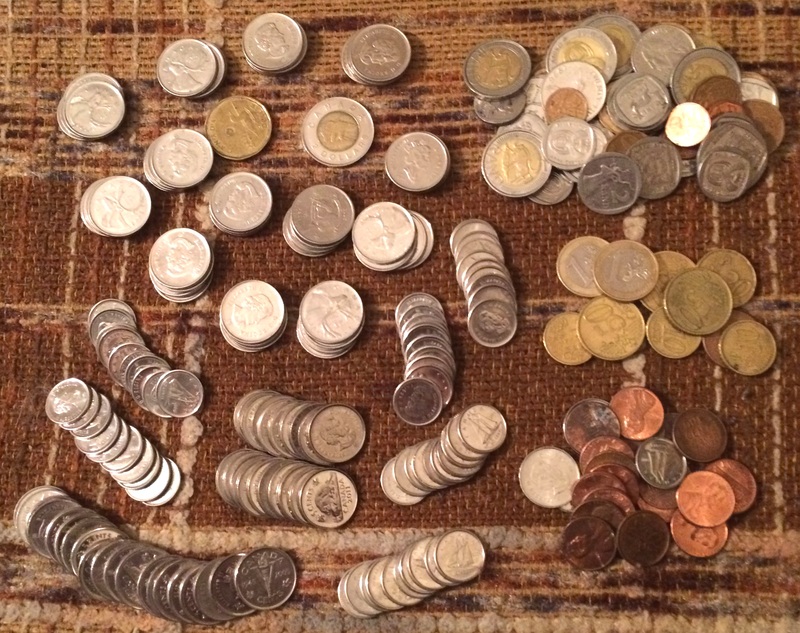 I had better luck on that front last year, but I still found around 24$ overall, not including Euros and other foreign coins. Better than nothing! My best cash find though was this gift card. I was optimistic that there would be a little money left on there, but I wasn’t expecting it to be 63$! 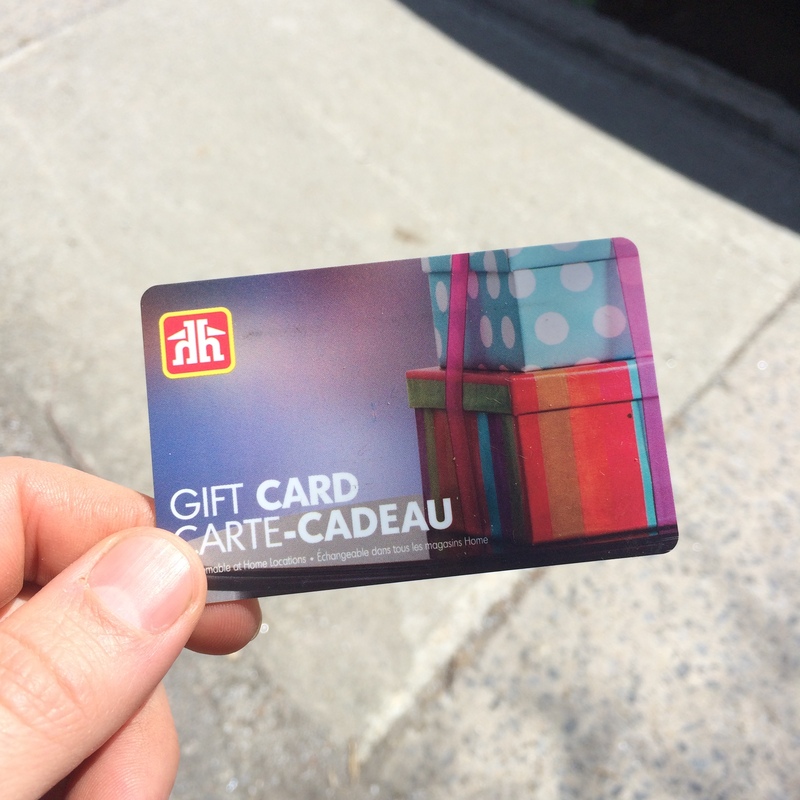 This is actually the first time I found a gift card with money on it, and obviously I hope to find more going forward. I feel like it’s something I should see more often than I do, and I wonder if I’m just overlooking them as I scan and evaluate the trash. I look forward to doing this again next year! However, July 1st (aka Moving Day in Montreal) is coming up as well. This will be the first time in a few years that I won’t be moving myself, and I’m excited to see what I can find on the curb. Saturday is supposed to be 16 degrees, sunny and not at all windy. That means it’s time for another yard sale! The weather hasn’t been cooperative in the month since my last one and I’m really looking forward to unloading some stuff. 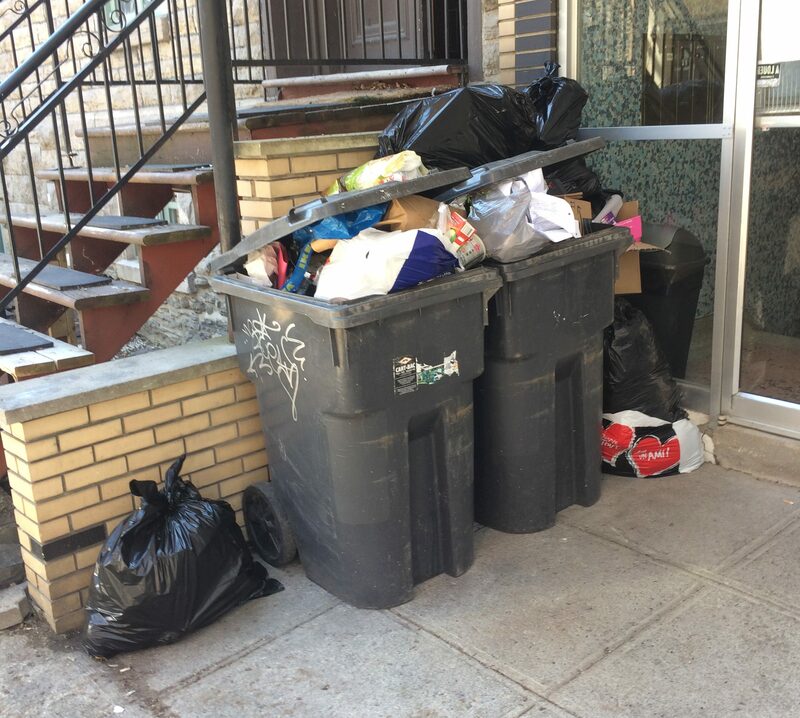 I have way too much right now, both from the winter and from a productive spring cleaning season, and at a certain point the excessive volume reduces my enjoyment of trash picking. Junk starts to clutter up my life, I have nowhere to put things, and I feel more like a hoarder than a seller. But yard sales always remind me that people actually want the stuff I collect, and that it oftentimes brings a little joy into their life as well. A friend of mine convinced me to do the sale at his place, so the location will be at 5031 St Urbain (near St Joseph) in Montreal. It’s not far from my two usual yard sale spots, so it shouldn’t be hard to find. We’ll probably start around noon, and end around 6PM. Please email me if you have any questions! One of my recent finds will come in pretty handy. I now have a legit folding table, so I’ll be able to get a bit more of my junk off the ground! 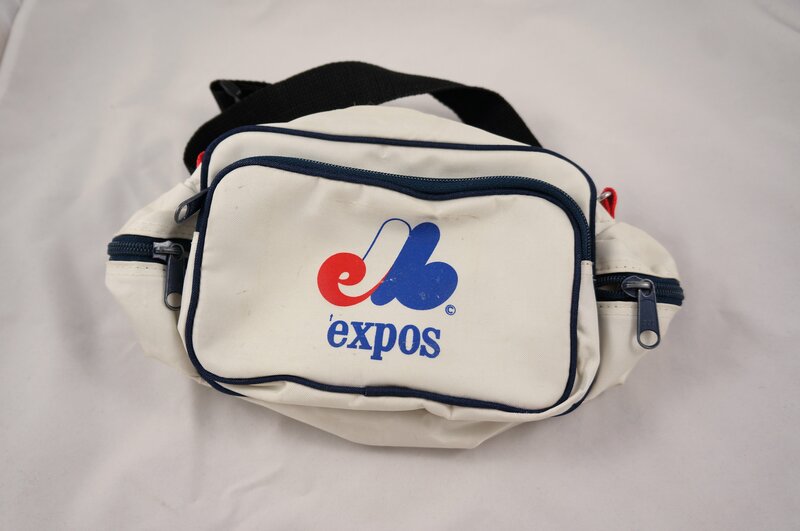 I also found this neat c.1980s Expos fanny pack that’ll be useful for holding money. Otherwise, as you may know I’ve recently started going out in the mornings instead of at night. That means I end up meeting a lot more of the people who’s trash I’m picking. Sometimes it works out okay, but other times people ask me (in varying degrees of politeness) to leave their trash alone. For instance, I started looking through the trash at this pile. Found a few neat things. Then a kid, probably somewhere between 17-20, comes out and asks me what I’m doing, and tells me not to look through his trash. “It’s only papers.” At least he was reasonably nice about it, offering me the little stereo system in the box on the right. Still, there were some nice things in his trash that definitely weren’t papers (unfortunately, I was only able to look inside two bags). 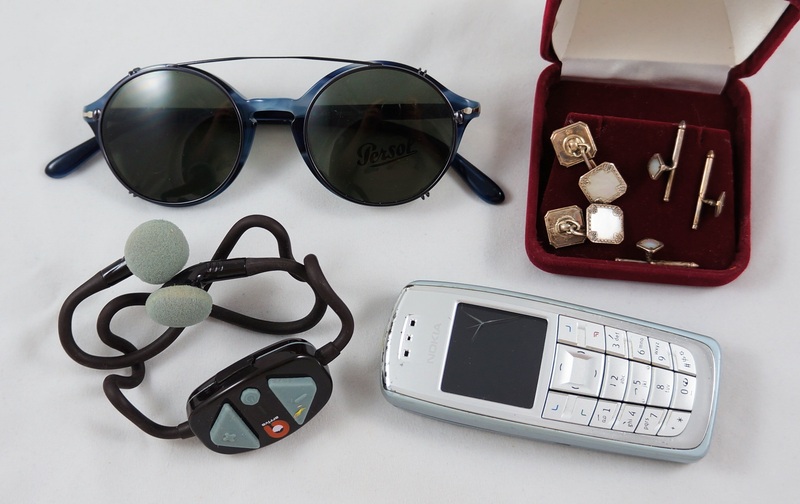 I found some nice silver cufflinks, a legit-looking pair of Persol sunglasses, some electronic doodad and an old cell phone to add to my collection. If I were feeling more energetic I’d have chastised him about throwing out a cell phone; he was kind of nice but still power tripping a bit. However, he was Mr Rogers compared to the lady I met later on, who almost looked like she wanted to fight. She rushed towards me from her house, complaining about trash pickers (not me I guess, as it was my first time stopping!) going through her stuff all the time and I guess causing a mess. She wasn’t polite to say the least. Unfortunately I didn’t have time to look through any of the bags, which almost certainly held good stuff, but I did take this “street surfboard” that was sitting on top of the pile. I told her she should have donated it to charity, and she whined that she was too busy moving and dealing with all the stuff. Boohoo, I say. What’s so hard? Throw it in a box and bring it to the store literally 1km away. Some places will even come pick up donations. Anyways, there’s not much to do except move on and not take it too personally. I think we need to come up with a term to describe people who ask scavengers not to go through their trash, especially the people who are actually throwing out great stuff. My first thought was to play off “Nimby” (Not in my back yard), but thinking of new expressions is not really my forte. If you have any ideas us know in the comments! Despite the [insert new expression here] I have a lot of good finds to share with you, but most will have to wait for another post. I’ve been lucky finding postage stamps recently – that find saved me 6$! 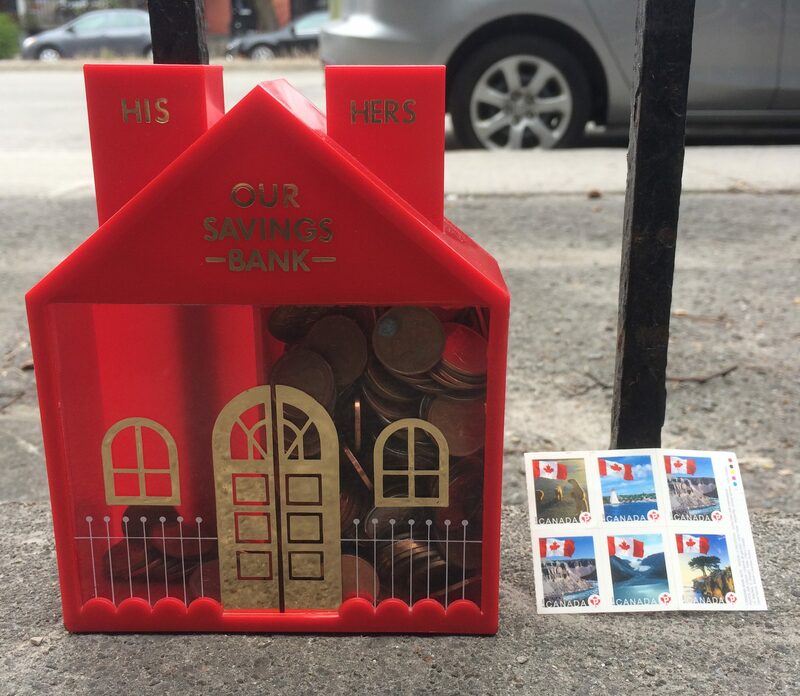 I also appreciated the savings bank, even if it contained only pennies. 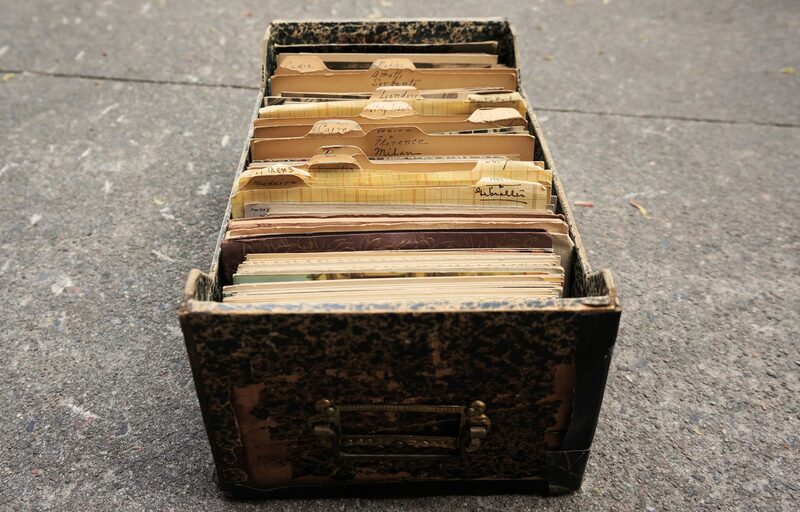 The place that brought us those photos from my last post threw out some more photographic stuff this week, most notably this box full of old postcards. Many date back to the early 1900s. I’d say they’re older on average than the postcards from the collection I found around this time last year. However, I enjoyed finding that collection a bit more because it was much more Canadian. These look to have been collected while traveling across Europe. The way this collection is organized is cool, I’ve never seen a box quite like this one for one! 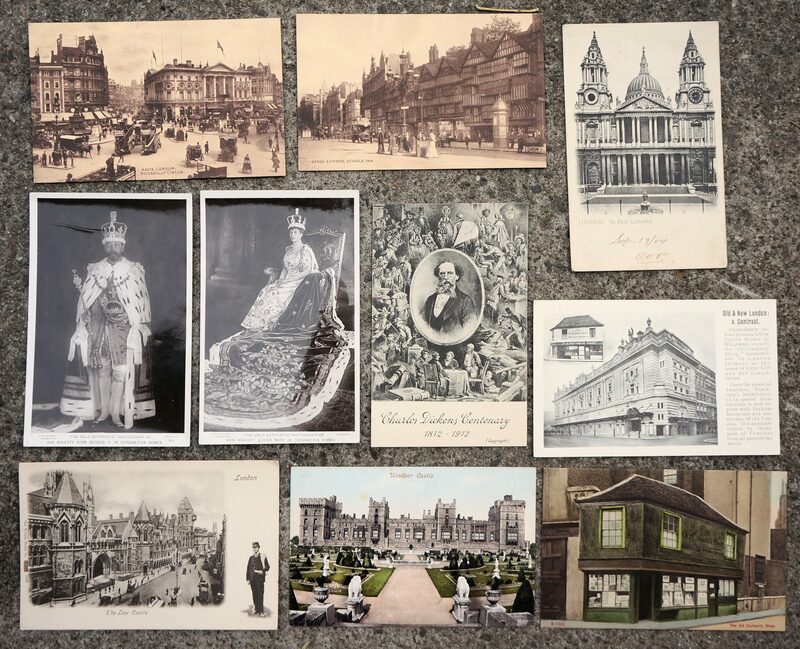 I don’t have time to photograph them all, but here’s a selection of postcards from the London section. The King George V and Queen Mary RPPCs are pretty cool. Those would date from somewhere between 1910 and 1936, I’d guess on the earlier side of that. Note the “Sept 19 / 04” written on the postcard at top right. These ones are all from the Rome section. My favourite so far is the Benito Mussolini at top left. I think I’ll put these in storage for now, and then list them on eBay in the fall or winter. I think that I should be able to make a couple hundred dollars from this collection, maybe more. Anyways, that’s all for now. Hope some of you can make it to the sale! eBay sales have been great the past couple of months! I guess the warm spring weather inspires people to buy stuff online. I also had my most profitable yard sale ever, so I’m not broke for the first time in a while, though I should probably spend most of that money my teeth. Before I show you what sold, here’s a collection of e-waste that I’ve saved over the past few months. I trash pick largely because I think it’s interesting and exciting, but I also care about the environment. I can’t save, or divert all that comes my way unfortunately; there’s just not enough time in the world to do right by each item I see. Still, I figure that recovering smaller sized e-waste, especially cell phones is a manageable activity. 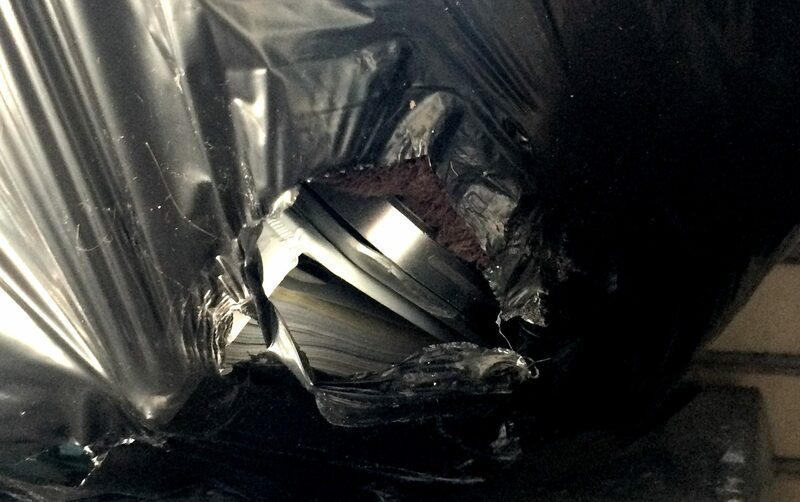 All recycling is significant, but I think e-waste recycling is particularly important: many of the metals are dangerous for the environment if sent to landfill, but they can also be easily re-used. Recycling small electronics is really simple too, many stores have e-waste recycling boxes for virtually effortless disposal. I dropped these off just three minutes from home! Just to clarify, I do sell these kinds of electronics when they have value. However, for a lot of the older stuff it’s just not worth the effort. 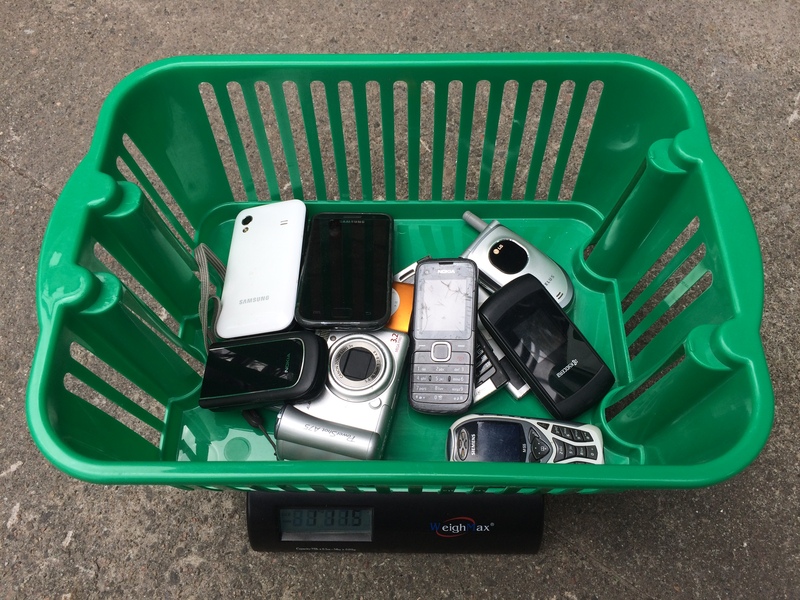 This batch of cell phones, digital cameras, and media players weighed 1.115kg. I’ll keep a running tally of how much I recycle, and hopefully by the end of the year the number will be impressive! Now, let’s get to the stuff that actually makes me money. 1. 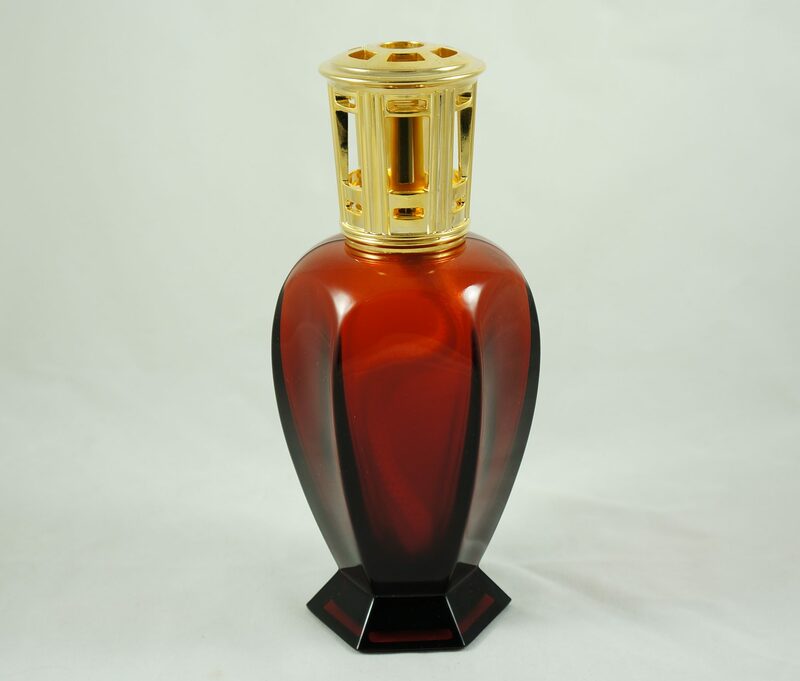 Lampe Berger: On eBay for 45$. I found this pretty close to home, on rue Esplanade. 2. Vintage Esso map of France: On eBay for 15$. I can’t for the life of my find a picture of this on my computer. 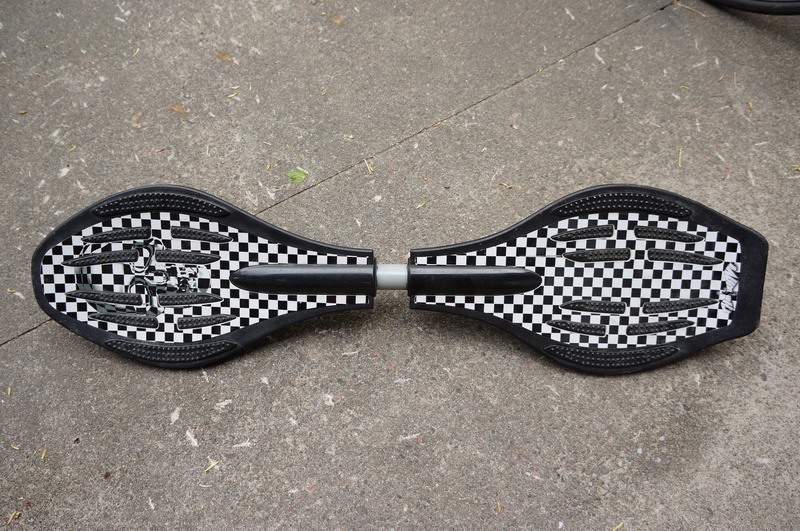 Here’s the eBay listing though, if you’re interested. 3. 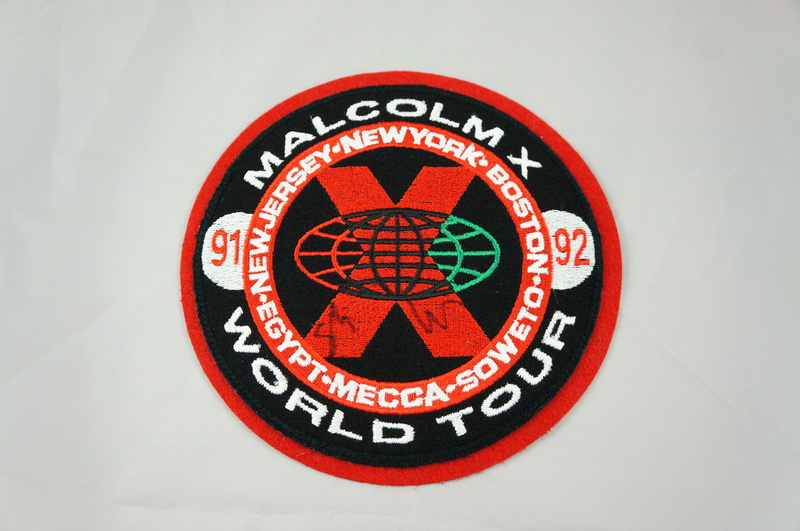 Malcolm X movie patch: On eBay for 26$. I decided to go the auction route in this case. I could have probably gotten more, but I’m also glad to see it leave the house. 4. 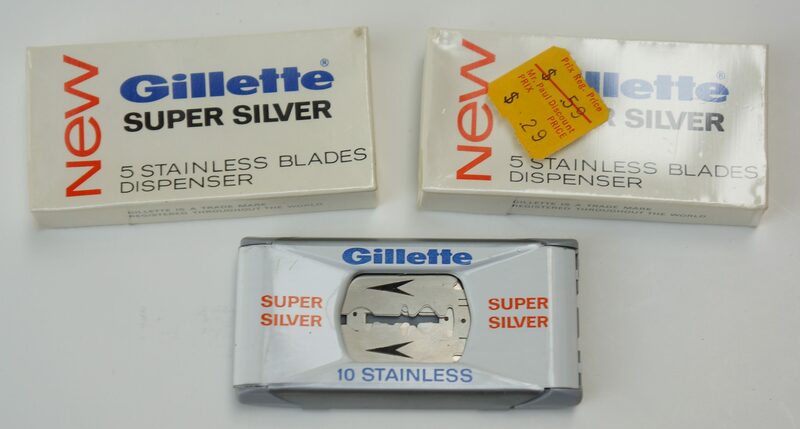 Vintage Gillette razor blades: On eBay for 22$. 5. Apple adapter: On eBay for 12$. I can’t find a picture of this either, but rest assured that it’s one of those boring white AV cable things. I’ve realized that anything Apple is worth listing, even the accessories. 6. 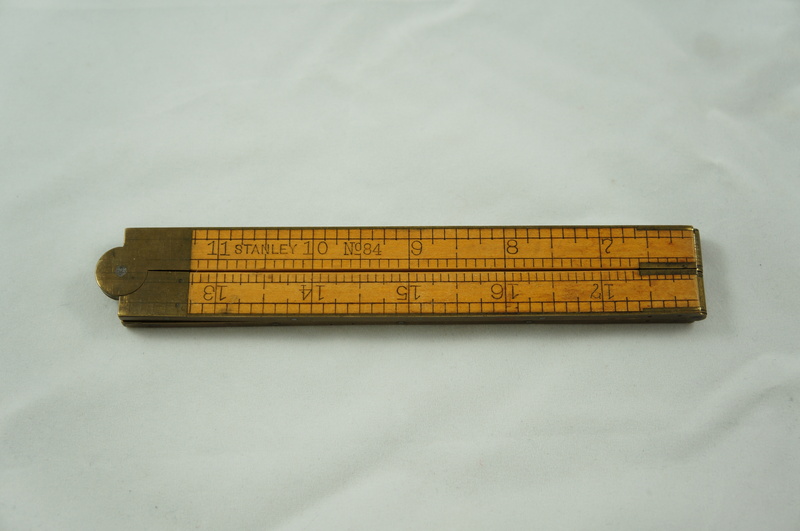 Stanley Carpenter’s rule: On eBay for 35$. I thought this was a pretty neat thing. Glad it found a new home! 7. 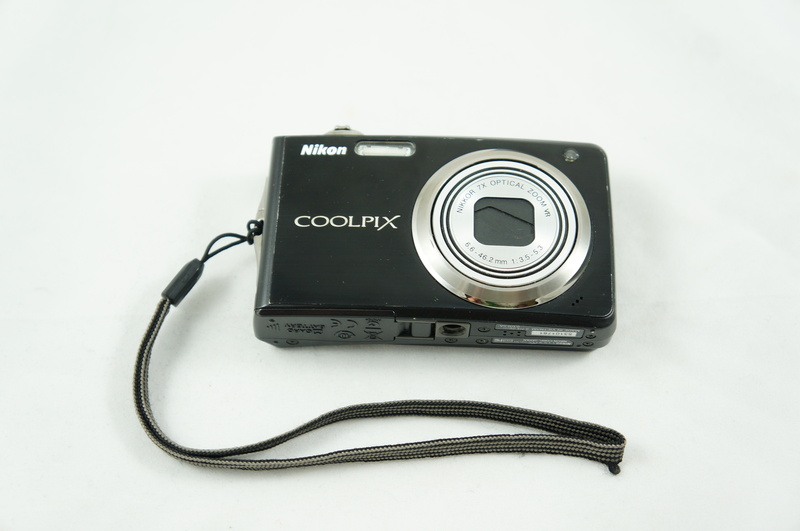 Nikon digital camera: On eBay for 35$. I find digital cameras often enough, but only occasionally does the charger come with them. This camera looked to be in good condition, and the model still had value so I took the chance and bought a charger from China for around 5$. It ended up working just fine! If it hadn’t, I would have held onto it anyways as I’m slowly amassing a collection of digital cameras to sell “for parts / repair.” I think I found this one in Outremont. 8. 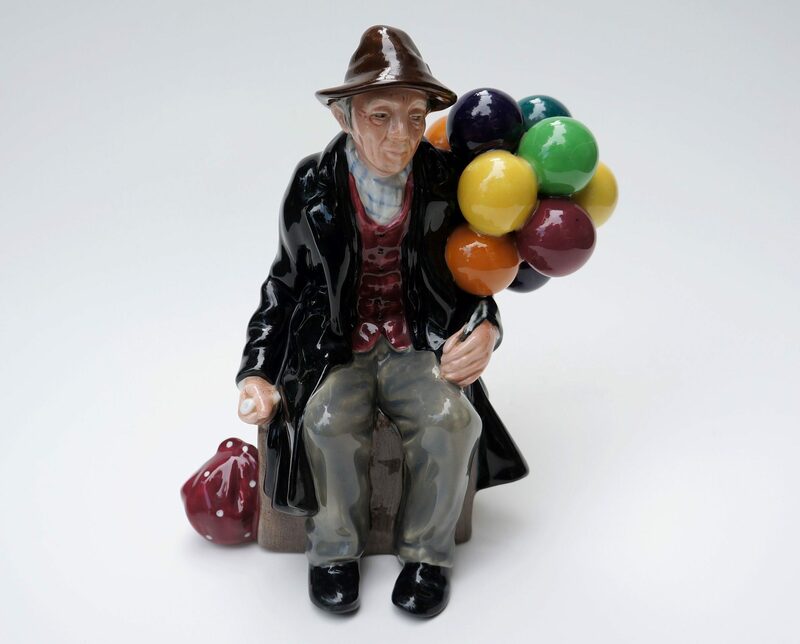 Royal Doulton “Balloon Man”: On eBay for 85$. No offense to Balloon Man, but I hope he’s gone for good this time! He also sold a few months ago, but was returned to me because of a mistake by the buyer. 9. 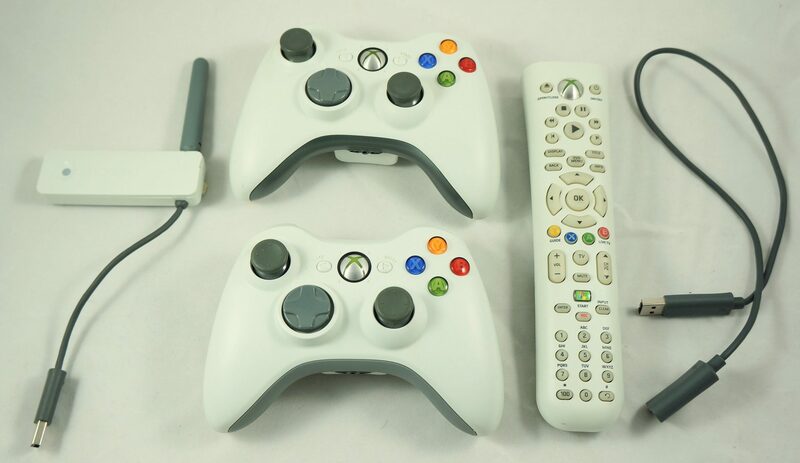 Xbox 360 accessories lot: On eBay for 35$. Whoever bought this probably got a pretty good deal. I wasn’t motivated enough to test each piece individually, so I listed them altogether on eBay at a solid discount. I wouldn’t be surprised if all this stuff worked fine. I found them with an Xbox 360 that wouldn’t turn on. 10. 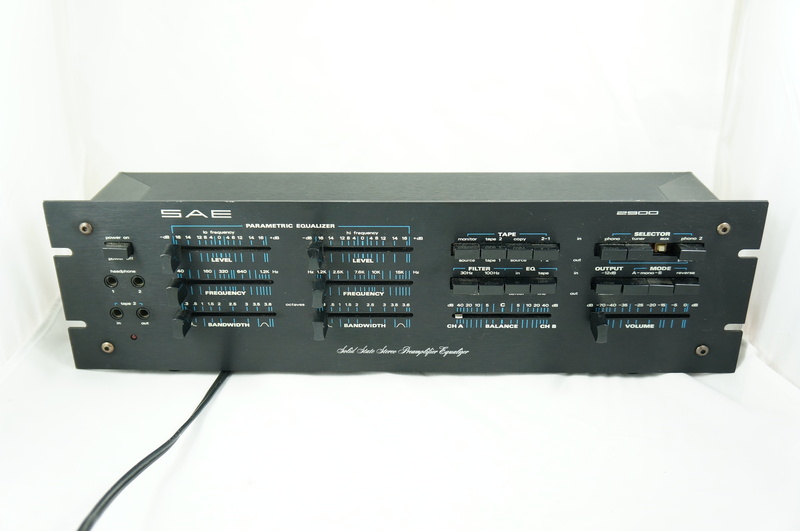 Vintage SAE equalizer: On eBay for 80$. I found this in front of some apartments on Wilderton (CDN) around the beginning of winter. It sat in storage until spring, when I finally got around to testing and listing it. I’m starting to get more comfortable shipping bigger items. 11. Space saving Apple keyboard: On eBay for 75$. I love these things. I found this one in that part of Rosemont with the Thursday evening pickup. 12. 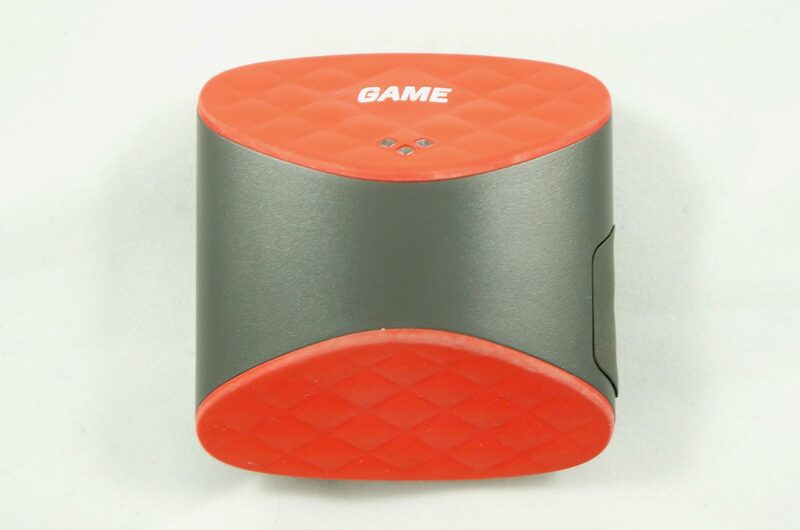 Game Golf digital tracking system: On eBay for 60$. Some guy on eBay offered me 10$ for this a few months ago, glad I stuck to my guns! 13. 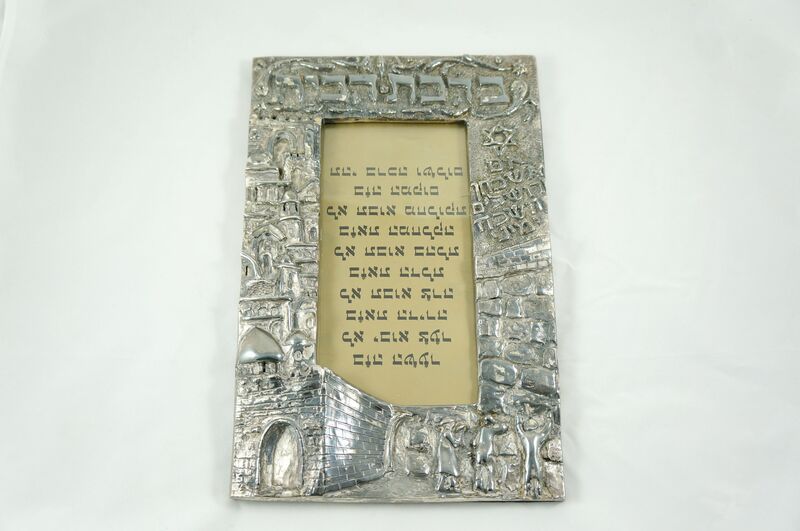 Lisham Art silver picture frame: On eBay for 175$. I wasn’t sure this thing would sell for anywhere close to my asking price, so I’m very happy with the profit here. 14. 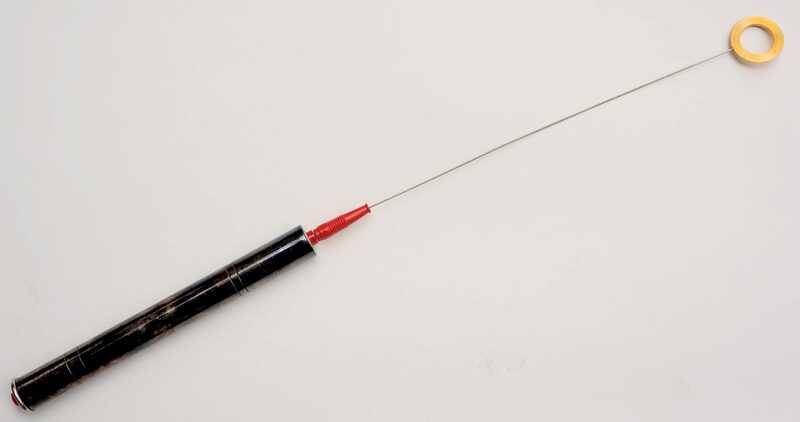 Vintage Heddon fly fishing pole: On eBay for 105$. It didn’t look to have ever been used. I had never before shipped a fishing pole, so that was neat. Found in the Plateau. 15. 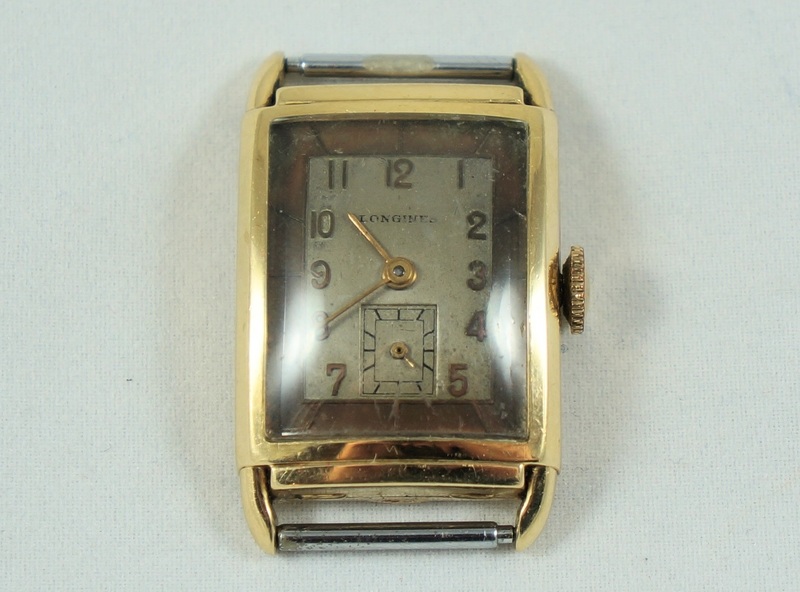 Longines watch, 14k gold: On eBay for 300$. This took a long time to sell. My price was too high originally, but I’d rather aim for too much than get too little. 16. Dr Oberbach biotensor: On eBay for 100$. This is a vintage dowsing pendulum for detecting energies or something. I don’t believe in that kind of stuff, but I don’t object to selling it at market value. 17. B&L cat-eye sunglasses: On eBay for 40$. 18. 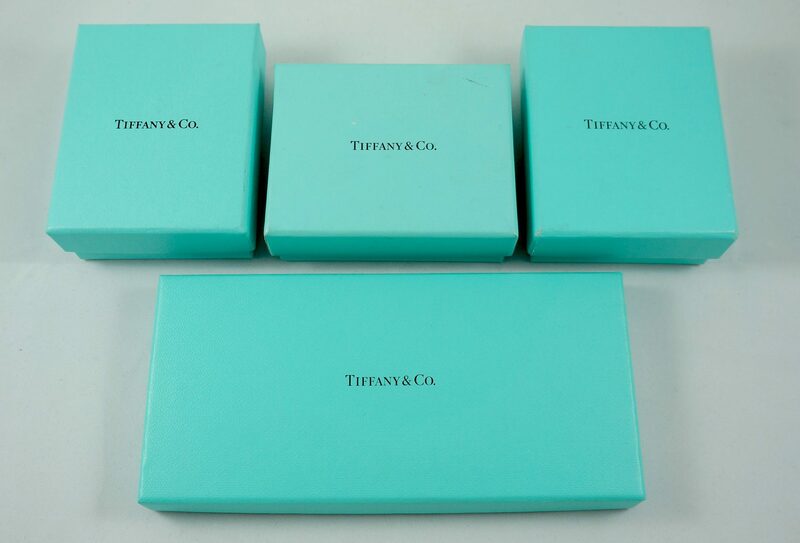 Small lot of empty Tiffany jewelry boxes: On eBay for 30$. Only two were in really nice condition, the other two were throw-ins. 19. 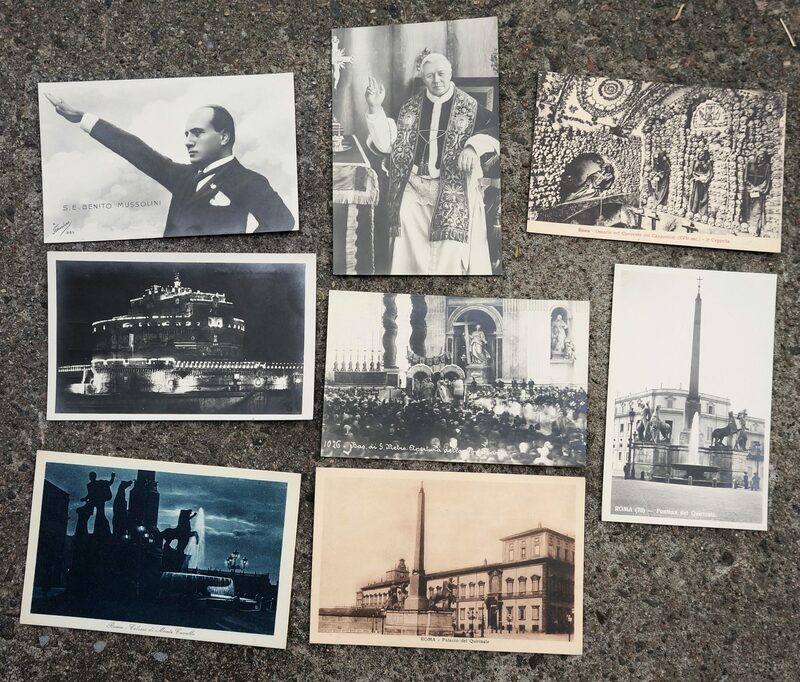 Chateau Frontenac postcards: On eBay for 10$. Not too many of these postcards left now! 20. 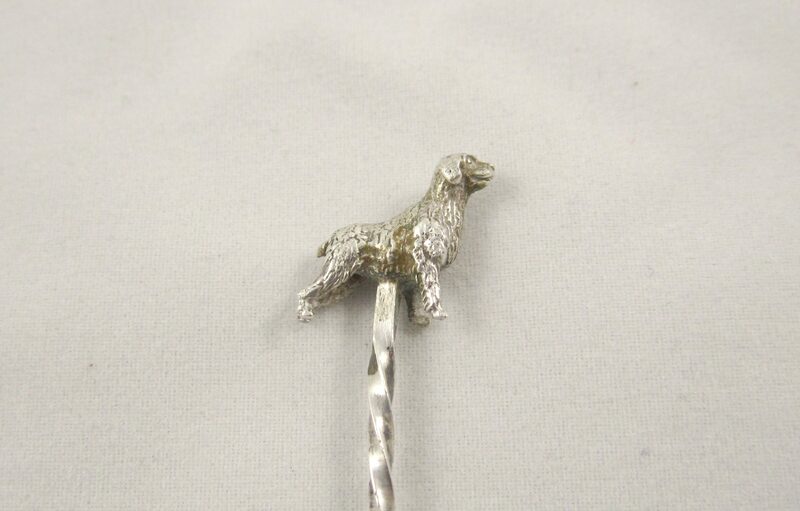 Sterling silver dog stick pin: On eBay for 40$. Found in Hampstead. 21. Oscar de la Renta Ruffles: On eBay for 60$. 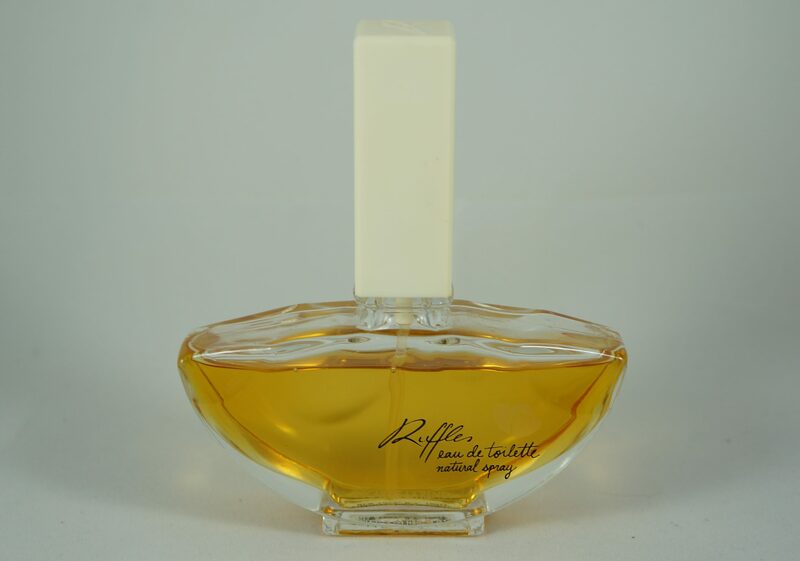 One of the many nice perfumes from that collection I found back in November. 22. 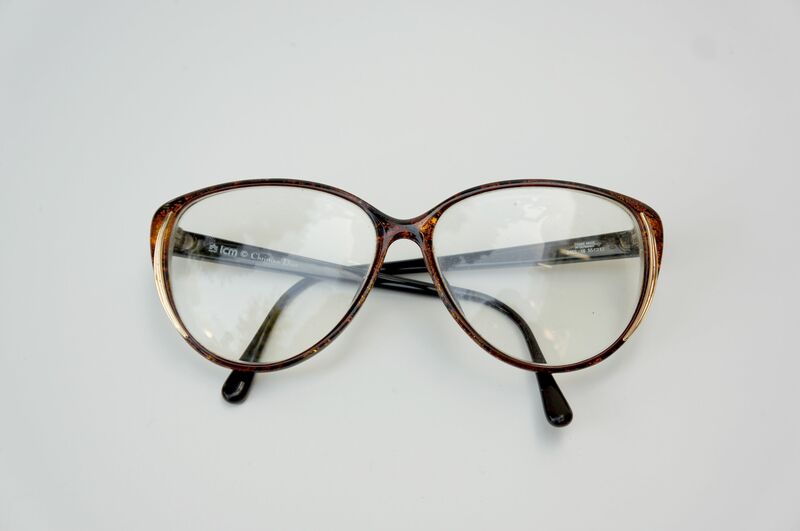 Christian Dior eyeglass frames: On eBay for 100$. Eyeglass frames tend to take a while to sell, but I often make good money from them when they do. These ones were pretty cool! 23. 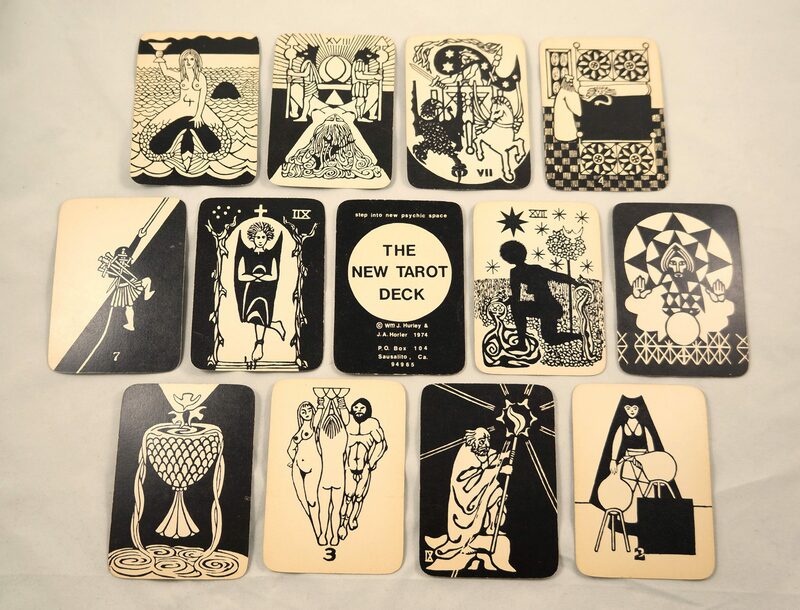 Vintage 1970s “New Tarot” card deck: To a reader for 150$. These cards are destined to be framed. I found them in a recycling bag in the Mile End. 24. 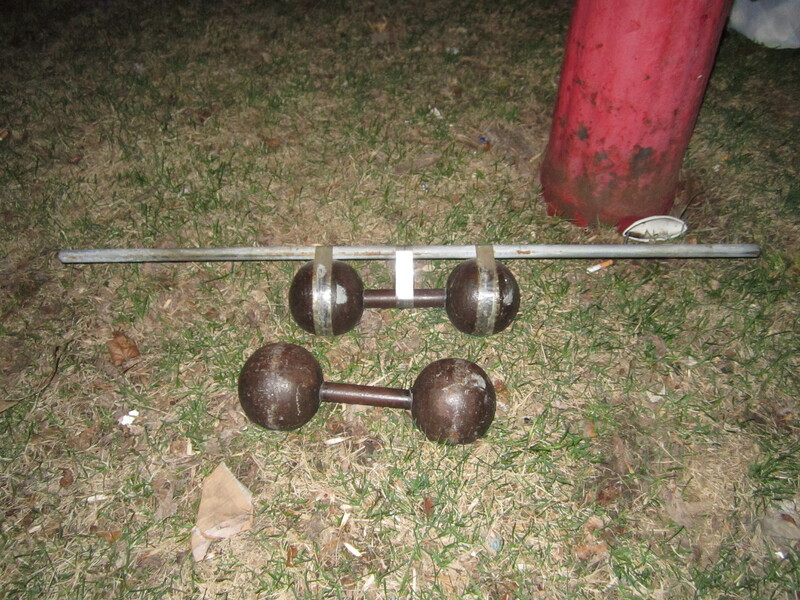 Vintage 25lb dumbbells: On Kijiji for 50$. 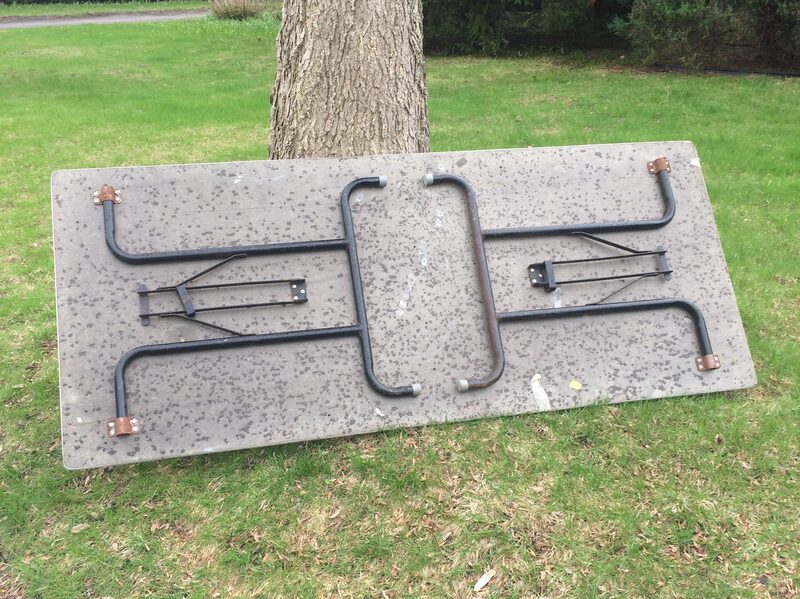 Someone had turned these into sketchy barbells using duct tape. I cut the tape off, removed the glue residue using “Goo Gone,” and eventually made some $$. This was one of my best finds from St Michel, which isn’t saying much. 25. Silver bracelet, made in 1950s Birmingham: On Etsy for 40$. I think I found this years ago, long before I bought my current laptop. Thus, no pictures unfortunately. 26. Yard sale: 620$. This was my most profitable sale ever! That’s partly because I’ve raised my sometimes ridiculously low prices, but I also had a ton (maybe literally) of stuff for sale after a winter of collecting. I was so busy that day that I didn’t have time to take any photos – I’ll try to get pictures of the next one. The weather hasn’t been cooperating, but it looks like I’ll finally be able to have a second sale this weekend. I hope it will be similarly profitable, a lot of my finds didn’t even make it to my first sale. 27. 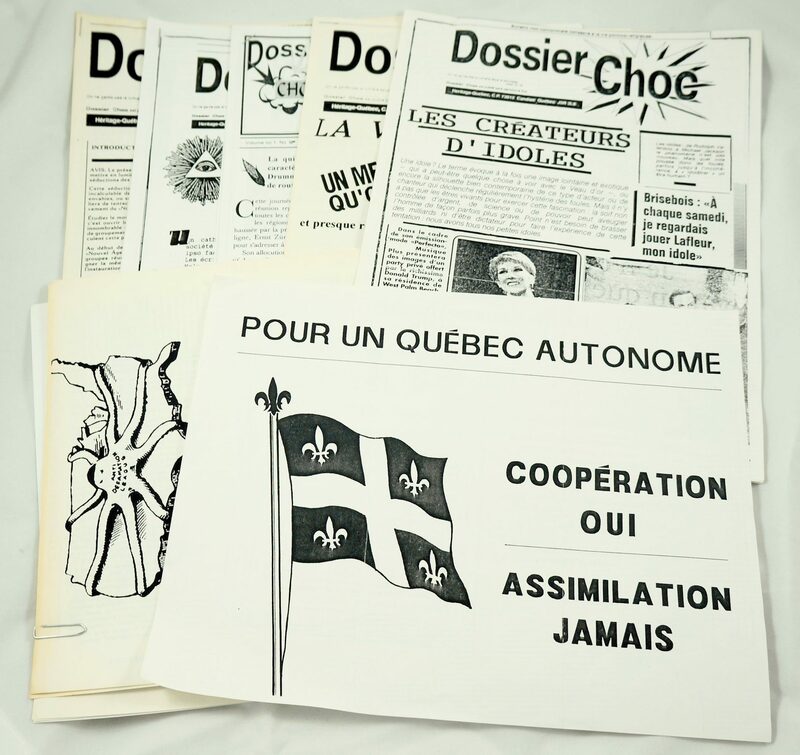 Quebec far-right magazines: On eBay for 300$. I was wondering if this stuff would ever sell, and then one day it did. These transactions (the magazines were divided into two lots) worked out pretty well for me – I’m very happy with the price, and they look to have sold to an archivist with an interest in the far-right. I very much doubt that far right groups spend any money buying back their archives, but it’s still nice to know that this stuff will probably contribute to a future research project. This kind of literature is niche to say the least, and much of it is actually pretty hard to find. 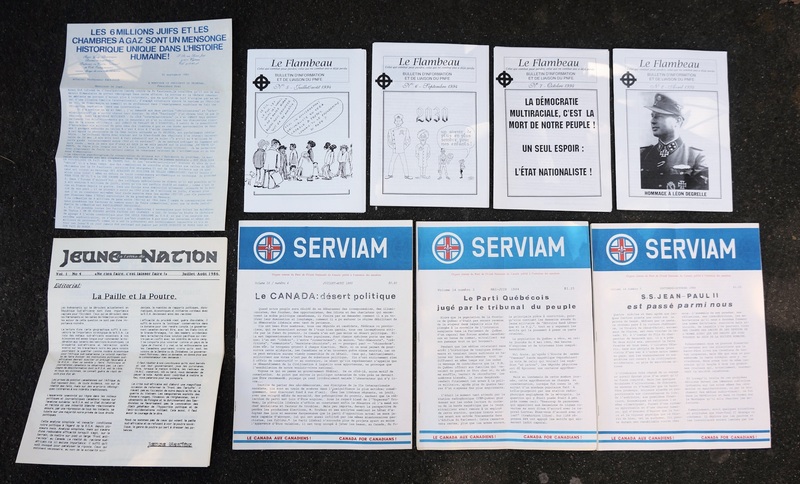 I still have more far-right literature on eBay, but the rest originates from France & Belgium. And just to clarify, the first lot was bigger than shown in the picture above! Total: 2645$, 7845$ so far in 2017. If only I could do this well all the time!